Coherence ratio is an additional function of the program “Cross narrowband spectrum”, which is used to evaluate the statistical reliability of frequency characteristics measurements. The coherence is used as a secondary characteristic only – it allows to evaluate the importance of other cross-spectral characteristics and their dependence on noise level and/or non-linearity. The value of coherence ratio is from 0 to 1. 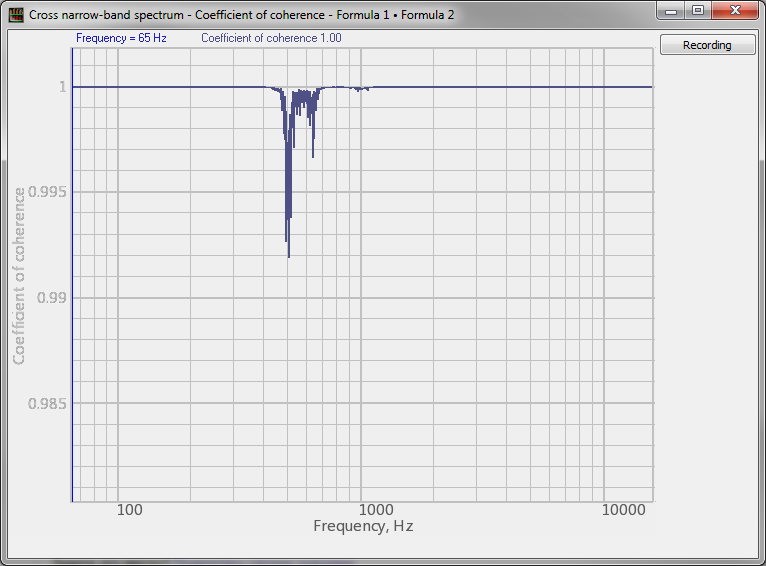 In ideal conditions, the coherence ratio is “1” for all frequency levels. In the case of any deviation from ideal conditions, the coherence ratio is less than “1” (in real conditions, the coherence ratio is often less than “1”). 4) presence of time delay in the course of interaction between two processes (in the case if the delay is comparable with measurement interval). To activate the dialog window of Coherence ratio program, click Options key – it will activate the parameters adjustment window. 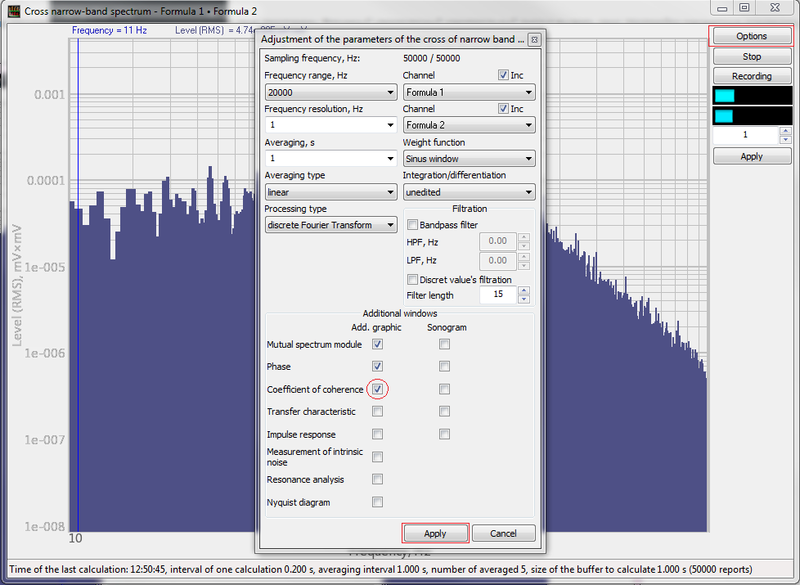 To enable additional graph displaying the coherence ratio, check the option “Coefficient of coherence” in the “Additional windows” section (see the column “Add. graphic“). Upon configuration of the required parameters click “Apply” key – you will see a new program window. Low coherence values may indicate irrelevance of cross-spectral characteristics for a particular frequency or indicate the necessity to increase the number of averagings in order to reduce the noise impact. Signals of physical nature often have stationary harmonics attributed to various factors. When recording the signals at various points at a particular frequency (e.g., at that of a radio channel) we observe constant phase difference value (depending on the distance to the signal source). In the case of noise interference at a particular frequency, the harmonic cross-spectrum phase will fluctuate. The coherence allows to evaluate these fluctuations and averaging increase allows to reduce their level.